Funds were sanctioned to hire two special trains to take Naidu’s supporters to Delhi and to meet other expenditure during the protest. 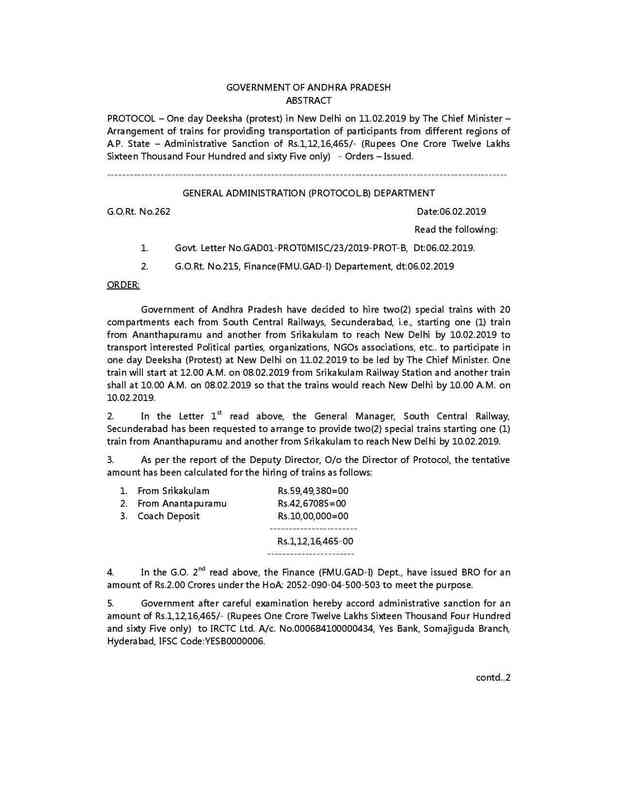 A government order issued by the General Administration department on February 6 sanctioned Rs 1.12 crore to hire two special trains – one from Ananthapuramu and one from Srikakulam – with 20 coaches each to take Naidu’s supporters to Delhi in order to attend the protest. 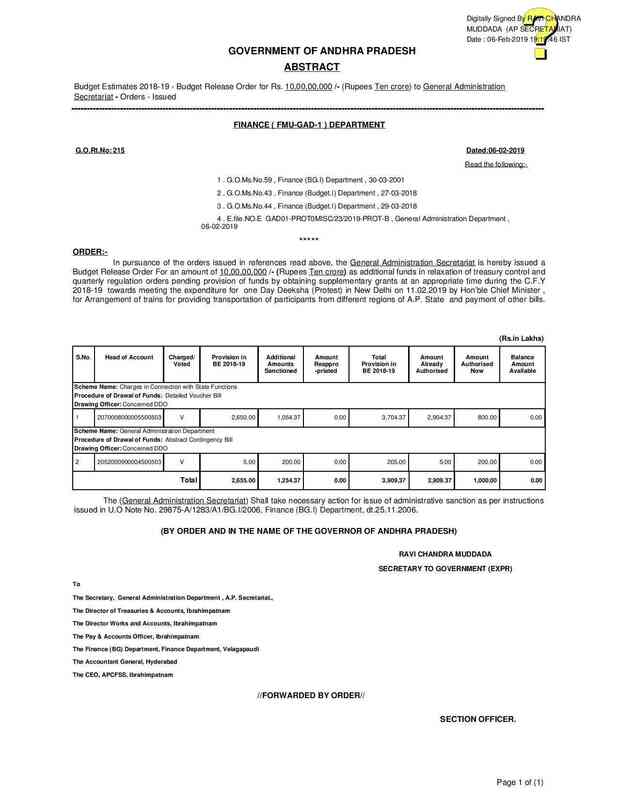 The Finance Department, in an order issued on the same date, ordered the release of Rs 10 crore for “meeting the expenditure of the one-day protest in New Delhi”. The funds were provided for “arrangement of trains” and “payment of other bills”. 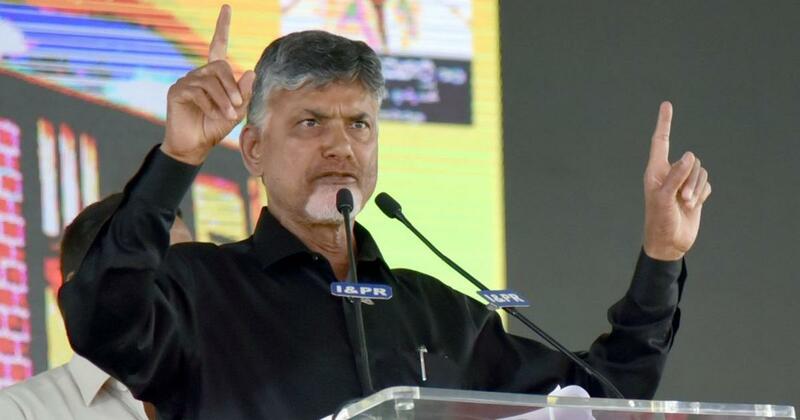 The ruling party, Telugu Desam Party, clarified that the Andhra Pradesh government has been organising “Dharma Porata Deeksha” across the state since 2017, reported India Today. 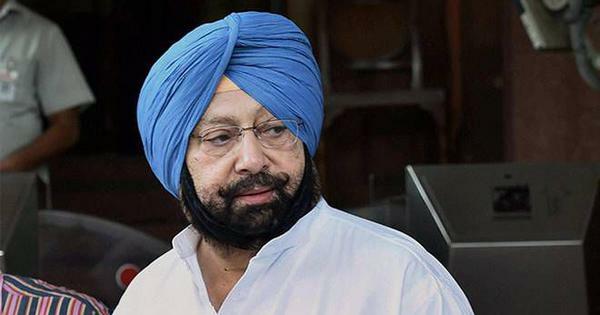 It said the meeting in New Delhi was similar to the ones organised in the state and that it was not a “political function”. Bharatiya Janata Party MP GVL Narasimha Rao said Naidu was organising fake “deekshas” in Delhi by misusing public money, reported The New Indian Express. During the one-day hunger strike in Delhi, Naidu alleged that Prime Minister Narendra Modi was not following “raj dharma” [duty of rulers] and denying the state special status. He warned the government of repercussions and said he wanted to remind the Centre of its promises made in the Andhra Pradesh Reorganisation Act, 2014.